Editors Note:  James Madison, author of many famous vaudeville skits, has what is considered the finest collection of early San Francisco theater programs and data in existence. He is himself a native San Franciscan, having been born on Washington Street above Dupont. There still stands at 722 and 724 Montgomery Street a building which in the [eighteen-] fifties was for a brief period utilized as a theatre, called The Melodeon. Joe Murphy, Lew Rattler, Frank Hussey, the Worrell Sisters and other early day favorites played there. The admission was 25 cents. 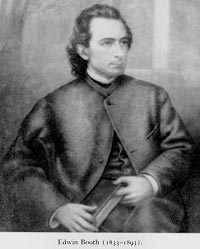 San Franciscos very first entertainment was given by Stephen C. Massett, better known as Jeemes Pipes of Pipesville, who on June 22nd 1849, at the Police Office, rendered a program consisting of vocal music and recitations. The front row was reserved for ladies. Four attended. 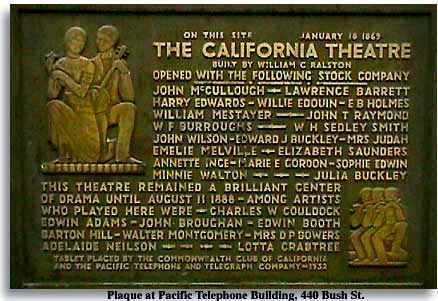 Among the first regular places of amusement were Robinson and Evrards Dramatic Museum on California Street, on about the spot where now stands the San Francisco Bank; the first Jenny Lind Theatre at Kearny and Washington, and the first Adelphi Theatre on Clay Street between Kearny and Montgomery. All these were destroyed in the big conflagration of May 4th 1851, and on June 22 a second disastrous fire reduced to ashes the second Jenny Lind Theatre and the Theatre of Arts on Jackson Street. With undaunted spirit of pioneer managers began rebuilding and before the year was over a third Jenny Lind was erected by Tom Maguire, on the same site as the two previous theatres of that name. The elder Booth played there, as did also Edwin Booth and Mrs. and Mrs. Junius Brutus Booth, Jr. It was a substantial structure, which after a brief occupancy, Maguire sold to the city and was for many years used as a City Hall. 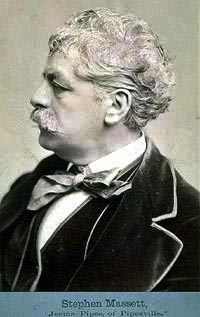 With the money thus gained, Maguire bought a one story building on Washington Street above Montgomery, known as San Francisco Hall and converted it into a three-story theatre, changing its name to Maguires Opera House. During the sixties many famous actors played there, including Edwin Forrest, Edwin Booth, John McCullough, Lucille Western, Frank Mayo, Matilda Heron and Adah Isaacs Menken. Maguires Opera House passed out of existence in 1873 and the no less famous Metropolitan Theatre on Montgomery Street between Washington and Jackson, shared the same fate, the cutting through of Montgomery Avenue, now known as Columbus Avenue, necessitating the sacrifice. A slice of the Metropolitan stood, however, until the big fire of 1906. On the corner of Sansome and Halleck Streets stood the American Theatre, where Lola Montez, Kate Hayes, Mr. and Mrs. James Stark, C.R. Thorne and Eph Horn held sway. In the sixties Maguire built the Academy of Music on Pine Street, below Montgomery, but his several seasons of grand opera were unsuccessful and after several uphill years, the Academy was converted into Coles Furniture Warerooms. It was at Egyptian Hall, a store show theatre, at 22 Geary Street, that David Belasco first gave evidence of his genius as a dramatist in 1878. The Egyptian Mysteries, a variation of the illusion known as Peppers Ghost, was exploited there and the program also consisted of one-act farces and dramas which young Belasco wrote and appeared in. In the seventies the hub of theatrical activity shifted to Bush Street. Above Kearny was located the California Theatre where even after a lapse of half a century the old California Stock Company is still gratefully remembered. Below Kearny, on the south side, was the Bush Street Theatre, originally called the Alhambra. After Charles E. Locke gave up the house in the late seventies, Mike Leavitt took charge and it was under his regime that Jos. Gottlob, Charles P. Hall and George Broadhurst received their early theatrical training. 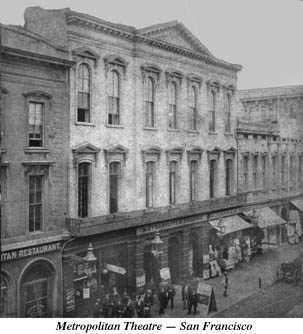 Directly opposite was the old Standard Theatre, previously known as Grays Opera House and Congress Hall. Here for several years Emersons Minstrels with Billy himself and the redoubtful Charley Reed shone forth resplendent. The first regularly established variety theater was the Bella Union, located on Washington Street above Kearny. When the latter thoroughfare was widened in 1869, the house was rebuilt and the entrance shifted to 805 Kearny Street. This house had a career of over forty years and among the top-notchers that performed there were Lotta [Crabtree], Ned Harrigan, Elise Biscaccianti, Charley Reed, Thomas C. Leary, Elias Lipsis, half brother of Adah Isaacs Menken, James A. Herne, Pauline Markham, Patti Rosa and Bob Scott, Charles Ross and Mabel Fenton, Johnny Ray, Harry Montague, Junie McCree and Weber and Fields. The Orpheum Circuit of today is an evolution of the managerial acumen of Gustav Walter, who came to San Francisco in the seventies and successfuly conducted the Fountain at Sutter and Kearny, the Vienna Gardens at Sutter and Stockton and the Wigwam, where the City of Paris now stands [at Stockton and Geary streets]. At this latter house he made enough money to build the OFarrell Street Orpheum, which opened in 1887 with Rosners Hungarian Orchestra and a big Variety bill. Headline acts of the era also played in smaller houses throughout California and the West. The Nevada County Historical Society is restoring a nineteenth-century theater where Lotta, the Worrell Sisters, Richard Jose, Mark Twain and Emma Nevada appeared.